A £75m “Agile” BBC IT project has evaded scrutiny because managers could make up the benefits as they went along, according to the spending watchdog the National Audit Office. Any likelihood of the project achieving savings is now officially rated as “in doubt” by the BBC’s own project monitoring. Since the costly failure of the £126m Digital Media Initiative, the National Audit Office says the BBC has made improvements to its processes and increased accountability, in a report published today. Project managers report faster and more often. 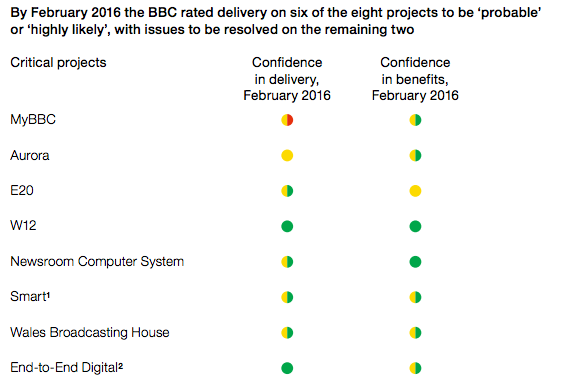 The NAO examined eight major projects at the BBC and conclude that although will most likely fulfil their requirements, one other project should, and one is doubtful. The MyBBC project was one of the eight examined, and it wasn’t cheap, costing an eye-watering £75.2m. The project was intended “to create a set of nine capabilities for use by BBC online services including iPlayer and the BBC news website. It is intended to allow the BBC to collect more accurate data on audiences and provide programmes that reflect their preferences.” In other words, it slurped data and allowed to customise the portal. The project is criticised for failing to set a savings plan, instead setting a target for the number of registered users. “MyBBC is an ‘agile’ project that was designed to define benefits as the project progressed, but two years into the project it still was not clear what the BBC expected MyBBC to achieve overall,” the NAO notes. The End-to-End Digital project, a partial replacement for the utopian and unwieldy DMI, is also criticised for poor accountability, but the BBC thinks it will succeed in its goal to replace videotape. 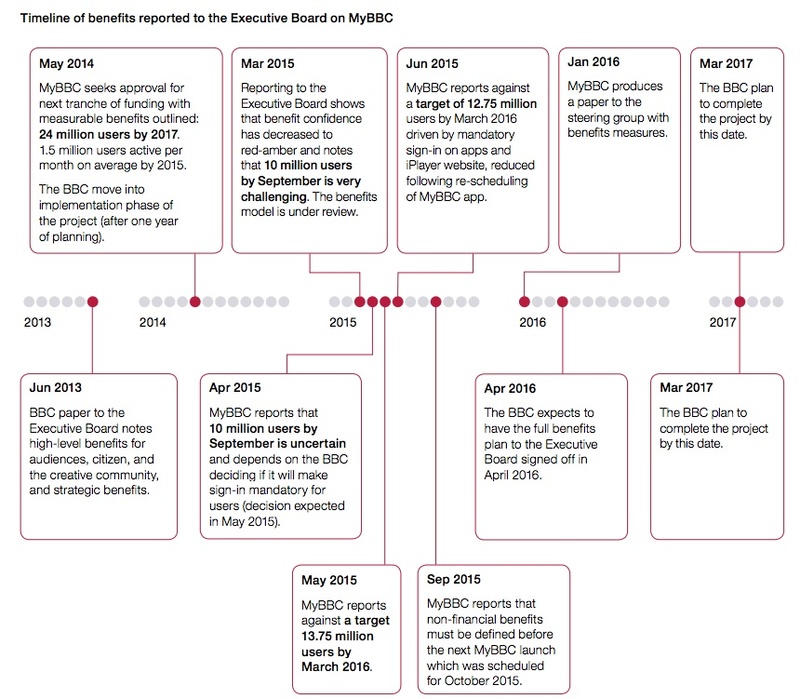 In the case of MyBBC, benefits were only defined late in the day, two years after the project had started. During the first year, MyBBC team set a target of eight million iPlayer sign-ups, but the NAO notes that the BBC “changed the target and the baseline several times during the first year. It did not show in its monthly reporting how many users had registered”. It is also criticised because the recipient of the work (in BBC language the “business sponsor”) reported to the executive sponsor. “The Executive have assured us that a complete set of benefits have now been defined and measurement has begun,” the Trust notes. At the BBC, Agile means ‘making it up as we go along’ • The Register.